Are you managing your tasks? Is your to-do list too long? Are your expectations of yourself too high? Are you putting boundaries on the amount of work that you’re physically, mentally, and emotionally capable of doing, in a period of time? I hear over and over from our clients that they’re underestimating how much time it actually takes to accomplish something. Women historically tend to struggle with boundaries, maybe a little more than men, in workplace situations. And anybody that’s in a caregiving role can really struggle with this including coaches, healers, and nurturers. 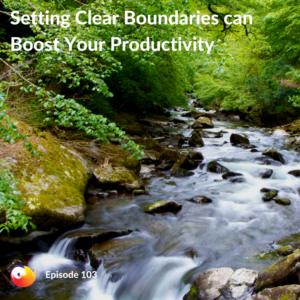 In this episode, we’re talking about the third pillar of nine pillars for productivity: boundaries. If you missed pillar number one: environment or pillar number two: energy, then go back and watch it AFTER today’s episode. There are actually two definitions for the concept of a boundary. The first one is a physical boundary, and literally, it’s a line that marks the limits of an area. So, that might be the boundaries of a state. It might be the boundaries of your backyard that’s marked by a fence. It might be a wall. Those are all physical boundaries. But then there’s also, what I would call a mental or emotional boundary. And we’re actually gonna dive into these boundary types, a little bit more in the podcast. But it’s the limit of a subject or a sphere of activity. It’s putting a boundary around how we think about things, how we ask for support around the scope of a project. This is really important for creatives. In fact, this morning, I got right out of bed, made my coffee, and went straight to the canvas, to work on a painting. Commanders don’t necessarily notice what’s happening around them because they’re focused on their tasks. Contemplators, the very cognitive style, need everything to be really neat. Visual clutter impacts them, whether that’s on the screen, or physical clutter, really impacts them. Conductors need to have physical space and time, away from people, because they’re so busy all the time. They nurture and take care of everybody they forget that they need some quiet time. So a physical boundary, for them, is going up to their bedroom to meditate, for five or ten minutes. Creators tend to invade everybody’s space because they’re people lovers and noisemakers. They’re very charismatic. They’re super creative, and their creativity can flow all over the house. So if you walk around my house, I’ve got art supplies pretty much in every room, in the house, except for Brad’s office. Here’s an opportunity to really look at these different Pillars of Productivity, and say, “Which are the ones that I need to focus on? Where do I need to build in those renewal rituals, that we talked about last time? Where do I need to build in some clearer boundaries, around time, so that I’m making time to do the emotional work?” Listen to the full episode on boundaries. Once You Know Your Productivity Style You Can Learn The Best Way To Become More Productive In Your Creative Business. Take the Quiz today and get your results! You can also subscribe to this podcast on our Youtube channel. Minette Riordan: Are you managing your tasks? Is your to-do list too long? Are your expectations of yourself too high? Are you putting boundaries on the amount of work you’re physically, mentally, and emotionally capable of doing, in a period of time? I hear over, and over from our clients, that they’re underestimating how much time it actually takes to accomplish something. Brad Dobson: Hi there. I’m Brad. Minette Riordan: And I’m Minette. Not only have we said all these things ourselves, but we’ve heard our community of creative entrepreneurs say them over, and over again. Brad Dobson: That’s why we created the Structure and Flow Podcast. I’m structure. Minette Riordan: And I’m flow. And this is the Productivity Podcast for Creative Entrepreneurs. Brad Dobson: We believe that doing more, and working harder, are not the solution to your productivity challenges. Minette Riordan: We believe in more play, more fun, and more profit. Join us, as we explore the interplay between structure, and flow, so that we can bring more grace, and ease, to your creative business. I think we need feedback, from people, before we’re ready to do the book. Brad Dobson: Like we need another distraction. Minette Riordan: I know. It’s so crazy. Brad Dobson: She just started talking about writing another book, oh no! Minette Riordan: At least one, maybe two more. Brad Dobson: I think we need to set boundaries around book projects, any projects like that. Minette Riordan: What? You wanna set boundaries around my creative projects? Are you crazy? Brad Dobson: Welcome, folks, to another episode of Structure and Flow, The Productivity Podcast for Creative Entrepreneurs. Today we are talking about setting clear boundaries. And apparently, we are busting through that right away. Minette Riordan: We are. Wow, this has been, you know. Brad started the recording, and I didn’t even know he started it. Telling me I can’t write another book. Brad Dobson: I am sneaky. Minette Riordan: And she’s kind of like me, she’s a little bit over the top enthusiastic, and effusive. Minette Riordan: We love Yolanda. So thanks for being an awesome fan, and listener of the Structure and Flow Podcast, Yolanda. We so, so appreciate you. And I’m super excited that we’re talking about boundaries today, ’cause I think it’s something that entrepreneurs, in general, struggle with. It’s something that often, women, historically tend to struggle with, maybe a little more than men, in workplace situations. And anybody that’s in a caregiving role can really struggle with this. And I realize that, as we talk through this, we’re gonna actually look at how boundaries impacts each of the four productivity styles, today. Brad Dobson: Yeah, and like the title said … I don’t know if I read the title. Brad Dobson: Setting clear boundaries can boost your productivity, and I think that’s a key part, that we’re tying it to. Clearly, boundaries are important, in lots of different ways, but as it relates to productivity, they can be pretty crucial. Minette Riordan: You wanna read the quote? Minette Riordan: It’s just for you, baby, ’cause I know you love Warren Buffet. Brad Dobson: Yeah, and Jimmy Buffet. Minette Riordan: All the Buffets. Brad Dobson: Jimmy Buffet calls Warren “Uncle Warren,” which I always thought was pretty funny. “The difference between successful people, and really successful people, is that really successful people say “no” to almost everything,” Warren Buffet. Minette Riordan: I love that quote, and it reminds me of a book you gave me for Christmas, years and years ago, when I still had the publishing company, about how CEOs of big companies organize and structure their time differently. I don’t even remember the name of the book. But one of the things that has stayed with me, and that was probably a decade ago, but one of the things that stayed with me was that, CEOs never have more than three things to do, on their list every day, their inbox. Their physical inbox on their desk is empty. And their task list is empty, because they know they’re gonna get interrupted, called into phone calls and meetings. But one of the things they do excel at is setting boundaries, on their time. Brad Dobson: Oh, yeah, and people at that level realize, well they probably realized years ago, that they have to do this. They physically cannot do their job, without it. And, I think we would posit that everybody needs to do it, to a certain extent. Minette Riordan: And yet, it’s hard, right? It’s hard to say “no,” to people, especially if you’re, in our Unique Productivity Style Quiz, if you’re a conductor, and you’re a caretaker, and you love nurturing, and moving, and coordinating, and taking care of people, it’s extra hard. Brad Dobson: So, let’s step back here, and get some definitions in place. Minette Riordan: Good, I was gonna do that. You beat me to it. Brad Dobson: Okay. Minette, what is a boundary? Minette Riordan: So there’s actually two definitions of the concept of a boundary. The first one is a physical boundary, and literally, it’s a line that marks the limits of an area. So, that might be the boundaries of a state. It might be the boundaries of your backyard, that’s marked by a fence. It might be a wall, or between two cubicles. Those are all physical boundaries. Brad Dobson: I’m gonna date myself. It’s like Les Nessman’s fake office, in WKRP in Cincinnati. He didn’t actually have an office, but people had to come up and fake knock, at his door. Minette Riordan: Which is all about setting boundaries. Les Nessman was really good at setting boundaries. Minette Riordan: Oh my gosh, I haven’t thought about that show in forever. I used to love that show. Minette Riordan: But then there’s also, what I would call a more mental or emotional boundary. And we’re actually gonna dive into these three types of boundaries, a little bit more. But it’s the limit of a subject or a sphere of activity. So it’s putting a boundary around how we think about things, how we ask for support, right, around the scope of a project. So, putting boundaries around the scope of a project is really important for creatives. In fact, this morning, I got right out of bed, made my coffee, and went straight to the canvas, to work on a painting. And, at some point I have to be done, with the painting. And this is one I’ve been painting on, for a long time, which is unusual for me. Usually I paint it, and I’m kind of done. Minette Riordan: And so, there has to be some boundaries around my creative output, like we were jokingly talking about, before we officially started the podcast. Boundaries around your ideas. And we were out for a walk this morning, and we have three funnels, that all need upgrading, and I’m like, “Brad, where do I put this information? How can I capture this?” ‘Cause I tend to process a lot while we’re walking, and talk through a lot. So I instantly came home and put them in notes, in Google Keep, so that then Brad can, you know, actually put projects around them, ’cause that’s his brilliance, better than mine. So, boundaries come up a lot in work, in a bunch of different ways. And so, just like we talked about, when we talked about energy, last week, there’s different kinds of boundaries. We’re actually gonna look at three kinds of boundaries today: mental, physical, and emotional. Brad Dobson: Let’s look at physical. What have you got down here for physical? Are you letting others intrude on your physical space, without permission? Well, Minette and I are pretty close here, so we don’t actually have a little wall between us. Minette Riordan: I think Brad likes recording the podcast, just ’cause we get to sit close. Brad Dobson: That’s right, exactly. Whether that means closing a door, or putting headphones on, to signal you are in a focus block. That can be pretty critical, when you need your quiet time, when you need your focus time. Do your kids know, like if you’re working at home, do your kids know, or your spouse, or significant other, do they know that that’s your time, that it’s not interrupted time? Do you turn off the ringer on your phone? Do you turn off the notifications on your phone? Those represent physical interruptions. A visual interruption is just the same as an auditory one, or you know, somebody actually pushing up against you in your room, like a kid. Minette Riordan: Yeah, gosh, I remember doing that. And even now, my office/craft room are at the very front of the house. Everybody that comes in the front door, I see them. Anybody that’s in the kitchen, it’s a noise distraction, or a physical distraction. And I’m easily distracted by people. And this is the creator mindset, in the Productivity Style, but we’re gonna talk more about that. We’re gonna go briefly through these, and we’re actually gonna share some solutions, for improving your boundaries, in each of these three key areas. Brad Dobson: Cats do not understand physical boundaries. Minette Riordan: They do not, or mental, or emotional. Brad Dobson: Cats will blow through any physical boundary. In fact, placing a physical boundary, means that it’s that cat’s mission to go through it. Minette Riordan: It is. Our cat was sound asleep, in the window, in my office, her favorite place, in her little cat tree. And as soon as I shut the door, to Brad’s office, to do the recording, she was at the door, meowing for attention. So, I put her outside. I went and closed my daughter’s window, ’cause she learned how to open my daughter’s window, so she could come in. Minette Riordan: Yes, yes. I was talking to one of my clients, to Candy yesterday. And we’re talking, and all of a sudden she looks down, and there’s little Paws, just trying to get her attention, and bringing her toys. Minette Riordan: Yeah, cats, cats are not good at boundaries, that’s so true. Brad Dobson: Moving on to mental, mental boundaries. What did we mean, by mental boundaries? Minette Riordan: So I would say that a mental boundary is about taking breaks. We talked about energy yesterday, and how we need to be managing all the different kinds of energy. But it’s also, are you managing your tasks? Is your to-do list too long? Are your expectations of yourself too high? Are you putting boundaries on the amount of work you’re physically, mentally, and emotionally capable of doing in a period of time, whether that’s an hour, or a day, or a week? And I hear over, and over from our clients, that they’re underestimating how much time it actually takes, to accomplish something. So are you conscious of your boundaries? Are you conscious of the amount of work that you’re doing? As Brad tells me, I work too much. There’s a lot to do right now, and I love it. So, it’s easy to keep working, and not put boundaries on. And as a commander, I have a real ability to just kind of muscle through, bulldoze through, and keep going. And I forget that I need boundaries around my mental capacity, so that I actually remember to shut down, and take a break. Minette Riordan: And this is family, this is [crosstalk 00:11:16]. Brad Dobson: Who’s our archetype, that struggles with this the most? Minette Riordan: Yes, the creator also struggles with this, ’cause they love people so much, right? So they get really excited about being with people. Brad Dobson: Right, and they wanna give, give, give, which is phenomenal, but it can very quickly turn into something that’s counterproductive, to the point of you losing yourself in giving. And so that’s, I think that’s where we’re going, with emotional boundaries. Minette Riordan: Yeah, and this is the classic coach, or caregiver, or nurturing personality. This is not about gender, but it does tend to be about the actual work that you do. They tend to put themselves at the very bottom of their to do lists, so they don’t have clear boundaries. A big example of this was one of our clients that we worked with, who was a graphic designer, and she kept complaining that she wasn’t getting enough uninterrupted creative time, to do her work. And so, I asked her to please do a time audit, so I could really see what it was, that was happening in her day. And it turned out that she had very poor boundaries around her response time to her clients, and that she was wasting her entire day answering emails, rather than batching her responses to emails into two or three times a day, and then carving out some of these longer focus blocks, like Brad has talked about, to do the creative work. That’s what she enjoys the most, and what she gets paid for, but every time that email would flash across her screen, she would feel that pull, and that need to respond instantly to her clients. That’s a great example of a conductor who was over giving of her time. Another classic example of this are coaches and consultants, who go over time on their sessions, or therapists as well, will do this as well. Massage therapists, I’ve talked to massage therapists who consistently go over, on the amount of time that they give during a massage. And yet, they’re not getting paid for that extra time, they’re not charging for that time, because they’re the one choosing. So they don’t feel like they can charge for it. And I find it’s actually annoying and disrespectful, when you don’t respect other people’s time boundaries, right? As a commander, I recognize that that’s my feeling, but if you told me it’s gonna be an hour, then you know, it’s an hour. And if you think that I need more, ask me. ‘Cause oftentimes, we are booking appointments back to back to back. So being respectful of people’s time is often a challenge, but it’s such an important gift, to understand. And I think it’s part of this whole, this Warren Buffet idea, and there’s many, many quotes around this. In fact, I think it was Gerald Jampolsky, who wrote a whole book about the fear of saying “no.” And just, really practicing, not saying “no” from a place of lack of caring, but saying “no,” from a place of respect for yourself. Brad Dobson: Great. I see down here, you’ve also got another type of emotional boundary, or for folks that are highly sensitive, taking on what’s happening around them, you know, what’s happening to people around them, taking on that emotion, sadness, grief, even happiness. I’m a pretty sensitive person myself, and I can, that can do pretty bad things to me, when I let it. So it’s definitely important to have some boundaries around that. I mean, we all need to be empathetic, but that can go too far. Minette Riordan: Absolutely, so if you’re highly intuitive, you have a lot of empathy, or you’re … One of the terms, the words for that, is being just highly sensitive, being an empath. And we’ve seen this happening, with a couple of our family members, where they worry about everything, until they’re exhausting themselves. And when you’re worrying about other people’s problems, it isn’t really healthy for anybody, and it’s not helpful, or supportive for anybody. I even experienced a little bit of this myself, yesterday morning. We have a 16 year old daughter, and she was having kind of a typical 16 year old meltdown moment. And it was heartbreaking, to watch, and to experience that. And I found myself feeling very sad, and feeling sad that she was sad. And yet, it’s her sadness, and it’s okay for her to be sad. And I needed to sort of cut those emotional strings, and just hold space for her, with, making it safe for her to feel sad, without feeling like I had to share in that. Brad Dobson: Yeah, and you don’t have to be the ice queen. Minette Riordan: No, I’m definitely not an ice queen. I cry at the drop of a hat. Bagpipes, bagpipes make me cry. Brad Dobson: Oh, don’t talk to me about bagpipes. Minette Riordan: And marching bands, I don’t know why, bagpipes and marching bands. And you know, lovely commercials on TV. Yeah, I tear up really easily. Brad Dobson: All right, back to boundaries, and boosting our productivity. How can we create healthy boundaries, that boost our productivity? Let’s talk about the physical ones. Minette Riordan: Okay. You wanna talk about it, or you want me to talk about it? Brad Dobson: I want you to start. Brad Dobson: I’ll just sit here, and tell her when she’s wrong. Minette Riordan: Oh, ha ha ha. I thought you were gonna say you’re just gonna sit there, and look pretty. Minette Riordan: So, managing physical boundaries, to boost productivity is about managing both space and time. Something as simple as, one of my clients that I worked with a while back was having trouble with her kids coming in and out of her office. And so, it was a matter of just one … And then she was also having trouble shutting down at the end of the day. She wanted more quality time with her family, but she kept being pulled back in to her office. Brad Dobson: Oh, that’s hilarious. Minette Riordan: Into her office, because it was closed. She didn’t need to be there. And then, after the kids were in bed, if she chose to spend an hour, she could. But it was better off, that she actually spent time with her husband. So that’s an example of managing physical space. If you work in a coworking space, or in an open office, at a big table, with people, or Brad, in the cubicle farm for years, and years, and years, you can use headphones as a physical boundary, even if you’re not listening to anything on the headphones. Having the headphones in is a physical indicator to other people, that you’re focused. Brad has started shutting his office door, when he’s in a focus block. I don’t have a door, right? But he’s learned to not just walk into my office, but to pretend knock. Minette Riordan: Yeah, “Talk to the hand, the ears aren’t listening.” So, what movie was that from? Brad Dobson: Oh, I can’t remember. Minette Riordan: That was the silly nanny lady, Drescher, Fran Drescher, right? Once you’re kids can tell time, it’s all over. Minette Riordan: Throw the cat in the mix, and it’s kind of crazy. Brad Dobson: So, these physical boundaries extend into the virtual world, too. So that means, obviously, like we said, your notifications on your phone, on your desktop. Minette Riordan: Reddit, turning your Reddit off. Brad Dobson: I don’t have notifications for Reddit. But, for email especially, it’s very easy to fall into the trap of responding immediately. We talked about that a little bit already. It’s really important that people understand, and you’re training the people on the other end of the email, that you respond at certain times, during the day. And it could take you up to X hours to respond. I heard a great comment about, I can’t remember who this was, some star, something. Anyways, when you look at your email, it represents things that other people want from you. So this person’s comment was, I thought it was well taken, was that that’s secondary to what you want to do. I mean, yeah, I understand if you have a boss, and their needs are more important than … Or, that’s your job. But, for those of us that are entrepreneurs, all that stuff in your inbox, I mean, almost all of it, is things that people want from you, not what you want to do. Minette Riordan: And I wanted to mention clutter, as well in this. Right so, inbox clutter is one example of clutter, that’s taking up time and attention. And then, in episode 100, we also talked about environment, as being the very first pillar. And so, is clutter creating, or impacting productivity, in the workspace? That would be a physical example of setting boundaries. Like, one of the ways that I’m letting other people encroach in my physical space, that really ticks me off, is when my daughter comes home, and drops her giant backpack right in the middle of the space to get in and out of my office. And, all the shoes are right outside that space. And then, there’s … The other day we had four teenagers here, and everybody takes their shoes off in the door, which is awesome. I couldn’t even walk out of my office, because there was like this, you know, path of shoes there. Brad Dobson: I think you have a problem with boundaries. Minette Riordan: Apparently I do. And you know, kids are kids. They drop stuff everywhere. I certainly am not always great with physical boundaries. I tend to leave my shoes all over the house, instead of right at the front door. Or earrings, I get tired of wearing them, and I take them off. And there’s earrings everywhere. You know, so there’s definitely … Brad and I have very different thresholds about physical clutter as well. And so, learning to share, cooperate, and collaborate, in creating productive physical workspaces, is a really important part of boundaries. And each of the four Productivity Styles approaches that physical boundary differently. Like, the commander doesn’t necessarily even notice what’s happening around them, ’cause they’re focused on their tasks. The contemplator, the very cognitive style, they need everything to be really neat. Like clutter, that visual clutter impacts them, whether that’s on the screen, or physical clutter, really impacts them. I had a squirrel moment, there’s a bird, flying up under the eave of our house here, outside our beautiful window. Brad Dobson: Let’s move on to mental boundaries. Brad Dobson: Speaking of squirrels. Minette Riordan: Awesome, you didn’t wanna go through the last two Productivity Styles, though, around physical boundaries? Brad Dobson: Oh, okay. We’re not moving on to mental boundaries, yet. Minette Riordan: Yeah, so conductors, their physical boundary is making sure they have physical space, and time, away from people, because they are so busy all the time, nurturing and taking care of everybody, they forget to, that they need some quiet time. So a physical boundary, for them, is going up to their bedroom to meditate, for five or ten minutes. And then finally, the creator, they tend to invade everybody’s space, because they’re people lovers, and noise makers. They’re very charismatic. They’re super creative, and their creativity can flow all over the house. So if you walk around my house, I’ve got art supplies pretty much in every room, in the house, except for Brad’s office. So, you know, making sure that our Productivity Style isn’t totally clashing with the people that we’re living and working with, is really important. Brad Dobson: Sure. So, in the last episode, we talked about renewal rituals, and how important it is to take mental breaks, during your work. I think that’s a critical part of setting up mental boundaries. What else have we got here, Minette? Minette Riordan: Well this, as I said before, is about managing your tasks more effectively, and your to-do list more effectively, and making sure that you’re not overburdening yourself, by taking on tasks that perhaps, aren’t even yours to do. This has a lot to do with, are you good at asking for support, and help, from family, from coworkers, from colleagues, at hiring support? And in fact, in episode 104, which is the next episode, we’re gonna do a whole show on support, and how support really is the key to massively increasing your productivity, and your momentum, in your business. And we’ve been witnesses of that. The other thing I would say, about mental boundaries, is how honest are you being, with how you’re spending your time? One of our favorite recommendations, for our clients, and something that we have personally done ourselves, a couple of different times, is a time audit. How are you spending your time? Are you overworking? Are you overly distracted? Are you so busy working on the little, small things, that you’re not getting maybe, to your most important work? So, for me, those mental boundaries have a lot to do with how much we’re taking on. Brad Dobson: So these are internal things, whereas, the physical stuff, maybe more relates to external actors impinging on the boundaries. It seems like the mental one is more an internalized thing, where your bad habits, or life, or whatever, you’re letting it impinge, or giant to-do lists, are impinging on your mental boundaries. Minette Riordan: Yeah, absolutely. That’s a great perspective. I even wrote it down, on my notes. Brad Dobson: Oh, I get a gold star today, I think. Minette Riordan: You do. Yeah, although I did write it in red. I don’t know what that says, but. Brad Dobson: She doesn’t like red pens. Minette Riordan: I don’t like red pens. As a former school teacher, red pens don’t have a happy connotation, for me, even though I adore the color red. So finally, let’s talk about emotional boundaries. I think these are the trickiest, for people to really manage. And emotional boundaries are the one where, you’re staking a claim on your time, and on your emotional capacity for caring for others, where you’re really creating opportunities to rest, to relax. And the truth is, if you don’t get it, if you wait til it’s perfect, you’ll never get it going. And so, for me, those emotional boundaries are learning to say “no,” when people ask you to do something that you don’t want to do, or that takes you off track, from your most important work. And for example, right now, I spend a lot of time volunteering in the music program, at my daughter’s school. And they need a president of the board. Minette Riordan: Just say “no.” I have been practicing, ’cause when the kids were little, I said “yes” way too much. And I did too much volunteering, when I was trying to grow my first business. Volunteering in my community, volunteering at the kids’ school. And so, I’m getting really good at saying “no,” even though it would be really easy for me to say “yes,” ’cause it’s the kind of project that I really love. I’ll go in and volunteer in the part that’s gonna most impact my daughter, so that things get done beautifully, and happily, so that’s a boundary, that I have set for myself. I don’t need to run the organization, I can just show up, and give the amount of time that I have available. Brad Dobson: So I have a question for you, this came into my mind when you started talking about emotional boundaries. And I wanna understand, maybe this is some mental, and some emotional. But one of the things where being en entrepreneur has impacted me emotionally, is tying the state of the business, and the state of the business finances, to my own well being, or how I’m feeling that day. Because as entrepreneur, y’all are out there. You know what it’s like when you have lean months, or lean years, or whatever it is. You’re not making the money that you wanna make. And it can really impact your emotional state. And I know personally, I’ve had to shut that off. I’ve had to go and meditate. I’ve had to go and exercise, whatever it is. But I get to a point where I’m getting really stressed about it, and I realize that I haven’t set the boundaries that I need to, to prevent that from happening. Because we’ve talked about this, I’m sure, before, and if we haven’t, we probably should have, about we really believe that building a business is a journey of personal growth. It is, especially for those of you that are building small, solo businesses, where it’s just you, or a small team. And there is so much to do, and you’re juggling all these different hats. And you have to manage your energy, but you also have to manage your thoughts. Brad Dobson: Juggling balls, wearing hats. Minette Riordan: Juggling what? Oh, sorry. Brad Dobson: I love that. Minette Riordan: Let me mix my metaphors. How do you know people aren’t juggling hats? Minette Riordan: I meant juggling balls, or wearing all the hats, or all of that. Right, so, but this is a great example of an emotional boundary, where you’re putting boundaries around the stress and the worry that happens when you’re a business owner. And the way to have clear boundaries around that, is to have those renewal rituals in place, and to manage your energy. Brad Dobson: Yeah, and without them, it will eat you alive. Minette Riordan: Yeah. I mean, this is also why we talk about your big why, and how important it is to be really clear about why you’re doing what you’re doing. What’s the big picture end result, or the change that you wanna create in the world? Because that’s what keeps you motivated, and going, even when the going gets tough. And in every business, the going gets tough. It’s never a smooth sail. It’s not a clear ascension path, to the pinnacle of the mountain. It’s, you know, a crazy, winding road, with lots of potholes. Brad Dobson: No, I like that. Minette Riordan: It is. I mean, you know, I think about driving like, from Palo Alto across to Half Moon Bay, to the Santa Cruz Mountains, crazy, winding roads in there. That’s what it feels like. You’re going up, and down, and up, and down, and around. That’s building business. And if you don’t have clear boundaries, you’re gonna get burnt out, overwhelmed, stressed out, end up with some kind of autoimmune. We see that happen a lot, with people that end up being so fatigued emotionally, and physically, and boundaries is an essential part of staying physically, mentally, and emotionally strong, in your business. Brad Dobson: Great stuff. So, for our next episode, we’re gonna transition from boundaries to support. And we’ll be discussing support, and how asking for support is essential to increasing productivity, and reducing burnout. Minette Riordan: It’s gonna be good stuff. So hopefully you got some good takeaways, from some tips and strategies that, when you have clear boundaries in place, you will find yourself with so much more time, and so much more clarity around the tasks that need to get done. Because our definition of productivity is never about doing more, it’s about doing the right things better. It’s about quality of output, over quantity of output. And boundaries is an essential way to get you there. Brad Dobson: And if you’re just joining us, on your productivity path, take our quiz, our Unique Productivity Style Quiz. It’s at pathtoprofitacademy.com/upsquiz, and we’ll have that in the show notes, link to it. Quick quiz, just take you a few minutes, and you’ll get some neat resources, at the end of that. And we have an upcoming thing, that you’re gonna be able to buy, that’s even better. Minette Riordan: Yes, our Productivity Blueprint is coming. That’s one of my Google Keep notes. Brad Dobson: Yeah, exactly. So that’ll be cool. So this was fun. I’m enjoying these Pillars of Productivity. I hope you guys are, too. And we’re not quite halfway through, we’re a third of the way through. Minette Riordan: Yup, a third of the way through. Minette Riordan: And we’ll see you next time, episode 104, talking about support. And we’d love some iTunes comments. Tell us which Pillar is resonating most with you. Brad Dobson: Thanks for listening to Structure and Flow: The Productivity Podcast for Creative Entrepreneurs. To find out more about this episode, and others, go to pathtoprofitacademy.com, and click on the podcast link.